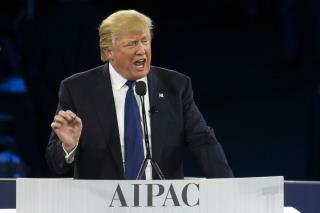 (Newser) – Donald Trump described himself as "a lifelong supporter and true friend of Israel" in remarks to the American Israel Public Affairs Committee on Monday. His speech to the powerful pro-Israel group focused on the Iran nuclear deal, which he called "catastrophic for America, for Israel, and to the whole Middle East" and promised to dismantle, the AP reports. He also addressed earlier claims to be "neutral" in the Israeli-Palestinian conflict, saying there is no "moral equivalency" and "Israel does not pay its children to stab random Palestinians," reports Politico, which notes that the AIPAC speech was the first time Trump has used a teleprompter and scripted remarks since he launched his campaign last year. Embarrassed yet trump humpers? .. what would it actually take for you to not vote for this dangerous physco? It seems insanity on immigration, defense and the economy doesn't do it for you. What if wanked all over your grandma's face? I suppose you would just say it shows he cares about the skin care of the elderly. Matrilineality in Judaism is the view that people born of a Jewish mother are themselves Jewish. So once again Trump shows himself to be dangerously misinformed on..... everything. No party or politician is perfect. However, if you’re a Democrat, or lean that way, you might be wasting your time debating with posters here. Some will hear you, but most have made up their minds & quickly dismiss other viewpoints. A few even want to upset you for spite. After you comment, use your time, talents, and resources to organize for the 2016 elections. Do what you can to help win back our State Legislature, the Senate, and win the White House. Pass it on & vote it forward!